Although flying under the radar, SLANG Worldwide Inc (CNSX:SLNG) (OTCMKTS:SLGWF) (FRA:84S) completed its most significant weekly session since debuting on the Canadian Securities Exchange 2-plus months ago. Buoyed by circumstances not its own, SLANG nonetheless was the beneficiary of robust ancillary interest as investors began connecting the dots. We look into the week that was, and provide a top-line qualitative investment case—supported by quantitative estimates and metrics—for SLNG as 2019 glides along. Of course, this week’s galvanizing moment for SLANG Worldwide was the definitive agreement pursuant to which Cresco Labs will acquire all of the issued and outstanding shares of Origin House. Under the agreement terms, OH common shareholders will receive 0.8428 Cresco Labs shares for each OH share owned, at an implied valuation of C$12.68 on a converted basis (↑5.22% premium over its March 29th closing price). This represent a total consideration of approximately C$1.1 billion on a fully-diluted basis. Origin House shareholders will hold +/- 20% ownership in the pro forma entity upon completion of the transaction. For those paying attention, the acquisition carried important implications for SLANG Worldwide stock. As a primary and correlated cannabis brands/distribution competitor, Cresco’s acquisition sets both a valuation floor for this exclusive cannabis sub-sector, while demonstrating that Tier-1 MSOs are very much interested in controlling as much of the distribution cycle as possible. Not only does this maximize dispensary margins and profitability by keeping revenues in-house, it derives ancillary benefits such as providing valuable real-time market data and insight. While I believe SLANG is more focused on acquiring brands than being acquired, Monday’s valuation peg nonetheless provided a key “a-ha” moment for brands/distribution focused operators. Remember, Origin House was afforded a $1.1 billion valuation on fairly moderate revenues and expanding net losses, while being a prominently a California-centric enterprise. That bodes well for a company like SLANG, which has a much broader national footprint and products on more shelves than any other competitor. Although the market was a day late in assessing CL/OH implications, it eventually priced-in them in. After closing at a record-low of $1.88 on April 1st—the day CL/OH partnered up—SLNG quickly turned around. Over the next four sessions, the stock gained ↑36.17% on a noticeable pickup of volume (April 3rd was SLNG’s 5th biggest volume day in its short history). Just like that, SLNG swung from record closing low to record closing high within the same week. Ultimately, consumers will migrate to dispensaries with the best ancillary products that move. There’s no room for stagnation as the retail arms race becomes increasingly more competitive. Now that Origin House will be imminently acquired, I believe SLANG Worldwide becomes the preeminent U.S. brands and distribution play in the current environment. Judging by this week’s price action on lieu of material news, we believe sharp investors are thinking the same way. It’s just one of the reasons we believe there’s more multiple expansion to come. Below, we lay out the qualitative reasoning for SLNG’s investment case, along with some quant research provided by Clarus Securities for good measure. At Midas Letter, we’re not huge believers of basing early-stage investments solely on quantitative research—especially with juniors lacking operating history. Ascribing an appropriate valuation based on peer comps and speculative assumptions is highly circumstantial, with strong odds of missing the target. Arguably, reliable estimates haven’t yet occurred at the top end of the market, let alone with an emerging company like SLANG. Thus, I believe a more holistic view of the company’s investment case in warranted. Just like our James E. Wagner Cultivation call in January, we’re focused more on the various components, market perspectives, management, intangibles and general market project-ability to make this macro call—rather than estimates alone. These things can’t necessarily be quantified by reliable projections just yet. Thus, we’ve laid out seven different qualitative dynamics which, in the author’s view, form the basis of an attractive investment thesis versus most others. We’ll get to some quantitative estimates in a moment, but I don’t feel it should be the primary driving force behind any potential SLNG investment right now—especially before the closing of remaining business units operating as Organa Brands. Essentially, SLANG Worldwide maneuvered their way onto store shelves of the dominant cannabis operator in Florida without spending a dime. Such partnerships can occur because SLANG’s quality brands tend to solicit increased foot traffic and generate better consumer experiences, while their technical expertise helps streamline MSO extraction/manufacturing operations. SLANG provides a win-win value proposition for partners, since vertically-integrated operators consider them non-competitive on a retail level. Expect similar agreements with various out-of-state MSOs as 2019 rolls along. Peter W. J. Miller is a co-founder, CEO, and Director for SLANG Worldwide. He’s also an cannabis industry veteran with over 10 years of experience with agricultural, operational, and technological aspects of operating in the sector. Peter—along with President & Director Bill Levy—previously co-founded Mettrum Health Corp., which was sold to Canopy Growth Corp. in 2017 for approximately $430,000,000. At the time, Mettrum Health was a leading licensed producer and vendor of medical cannabis in Canada. There’s nothing much more to add here. Both men are industry veterans with a proven ability to deliver incremental value to stakeholders. Being acquired by the world’s leading licensed producer is their ultimate validation of SLANG’s leadership and business building credentials. Peter Miller and Bill Levy’s dealings with Canopy Growth didn’t stop after selling Mettrum Health. Canopy Growth holds a warrant to purchase 31.6 million SLANG Worldwide common shares—or approximately 14% ownership stake if executed at today’s share structure—should cannabis and cannabis-related products become legalized under applicable U.S. federal laws. Essentially, SLANG is receiving tacit operational support from the world’s most successful branded licensed producer. In fact, a February 2019 corporate presentation of Constellation Brands lists SLANG’s pending Organa Labs acquisition as a key brand for Canopy, according to Clarus Securities. Either way, there’s very little not to like with this arrangement. SLANG should continue reaping the benefits of being a Canopy umbrella partner as the U.S. regulatory landscape clears up. Should that happen, SLANG’s revenue model will only increase as THC branded products could be allowed to cross state lines (perhaps similar to alcohol). Of course, if Constellation were to exercise all existing and new warrants, its ownership would exceed 50-percent in Canopy Growth, thus opening up new exciting new edible markets for SLANG down the line. That is a longer-cycle consideration to be sure, but a plausible one if you believe U.S. cannabis de-prohibition is on its way. As Peter Miller likes to say, SLANG Worldwide employs a “capital light” business model. On the CAPEX side, there’s no multi-million greenhouse to build or retrofit, and no state cultivation licenses to acquire. This keeps the enormous costs of achieving a national footprint in-check vis-à-vis vertically integrated operators (see Trulieve partnership agreement above). Their extraction, edibles and production line only costs only a few million dollars to serve a large state, and most of the capital demands are deferred to local partners. On the OPEX side, the company also doesn’t engage in retail operations, which eliminates ballooning brick & mortar headcounts. SLANG’s goal is to get their brands in as many chains as possible—not compete head-to-head on a retail level with their own stores. They are only interested in owning the pieces of the supply chain that is needed. Being beholden to the retail gatekeeper, investors might naturally assume that SLANG’s margins would suffer versus their vertically-integrated counterparts. Not so, according to Clarus Research’s inaugural research coverage. They expect gross margin is expected to stabilize at about 52%—including license revenue—and adjusted EBITDA margin to stabilize at 28% of revenues during 2021. Owning refined end-consumer brands, SLANG may legitimately benefit from compressing dry flower pricing provoked by mushrooming oversupply. Other vertically-integrated operators may not be so lucky. For rough contextual reference, the latter would put SLANG’s gross margins somewhere around what Hexo Corp. and Aurora Cannabis produced in their last fiscal quarters—before commoditization has set in. As we stated earlier, Cresco Labs acquisition of Origin House set a valuation bar for like brand/distribution-centric operators. OH was able to command a $1.1B valuation on the back of $6.62M Q3 2018 revenues and gross margins hovering at 7.67%; Q1-Q3 2018 [9 months]: $10.78M revenue, 12.05% gross margin. If Clarus Securities revenue projections (fiscal 2019: $82.3M; fiscal 2020 $417.4M) and gross margin assumptions prove correct (see above), is it more likely the $1.1B Origin House valuation bar moves higher or lower in a rapidly improving regulatory environment? As SLANG Worldwide is probably more brands-focused of the two companies anyway, one can argue margin capture and value per revenue dollar is inherently superior. Of course, this is a very simplified way of looking at things, but a powerful one nonetheless. Keep in mind, the de-criminalization and/or federal legalization of cannabis could eventually allow THC products to cross state lines, supercharging SLANG’s brand/distribution revenue potential over & above what Origin House has been able to capture to-date. SLANG Worldwide currently has the largest distribution network of any cannabis company. The company’s branded products are in approximately 2600 stores and available in 14 countries. Operating in 10 states, Miller muses that that company was the original “multi-state operator”. SLANG Worldwide carries proven, bona fide brands. 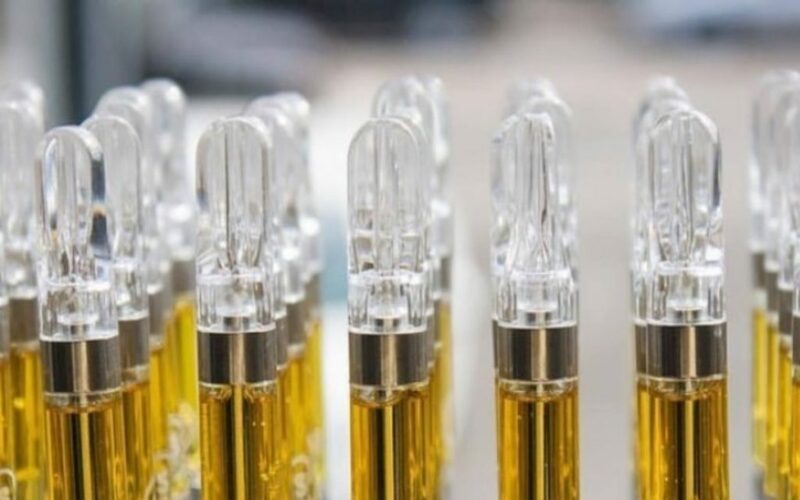 Their O.penVAPE brand is the highest selling brand in Colorado, with over $170 million in retail revenue generated since 2014. That’s just one of many. In any emerging sector, sticking with the industry leaders is generally a wise move. Now that co-branding/distributor extraordinaire Origin House has been acquired, SLANG will become the largest U.S. focused publicly-listed brand/distributor. While it’s a huge stretch to say SLANG Worldwide is devoid of risk (it isn’t), I believe—in many respects—the company carries a favorable risk profile over its vertically-integrated counterparts. We’ve already mentioned SLANG’s capital-light model, immunization against the commoditization of cannabis pricing (at least, partially), and ability to maneuver of MSO dispensary shelves without any CAPEX outlay. But there is more. Exactly. Given the government’s prodigious propensity to maximize tax revenue streams across all industries, it’s hard to imagine they’ll stand pat on the issue. I’m don’t believe this should be considered an imminent risk, but if you invest on 3-5 year timelines, it may come into play. To date, the only research coverage provided for SLANG Worldwide comes courtesy of Clarus Securities. While we believe additional coverage is just around the corner, Clarus has provided a strong preliminary blueprint on what investors should expect in the months ahead. Please contact them directly for permission to access the report. For fiscal 2019, Clarus is expecting adjusted EBITDA of $12.2 million on revenue of $82.3-million, and fiscal 2020 EBITDA of $113.7 million on $417.4 million revenue top-line. They expect gross margin is expected to stabilize at about 52%, which appears exceptionally strong for a brand-centric distributor. Adj. EBITDA margin is anticipated to stabilize between 27-29% of revenues for the totality of their estimating period. Important: The paramount assumption in Clarus’ forecast model is the expectation of SLANG to exercise its options to purchase the remaining business units operating as Organa Brands (NS Holdings and ACG) for a total of 82.5 million SLANG shares by October 1, 2019. SLANG’s key business units are to-date are the non-plant-touching portion of Organa Brands. OB had estimated consolidated total revenues of C$60MM in 2018. After tracking SLANG’s story for the past two months, last week’s Cresco Labs-Origin House news provided the impetus needed to write this piece. Why? Because it ascribed a definitive valuation to what similar brand/distributor-modeled companies should expect in the sector. I believe we saw the market beginning to price-in this fact, which largely accounted for SLNG’s material performance (↑36.17% from April 2nd on). There’s still some upside to go. 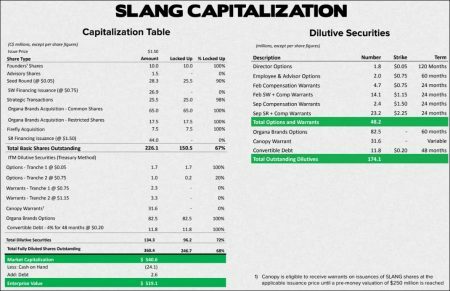 If Origin House is worth $1.1B fully diluted right now, how much is SLANG Worldwide worth at 360 million fully-diluted shares at $2.56 apiece? That includes 31.6M Canopy Growth warrants—which if exercised—would mean cannabis has become de-criminalized and/or de-prohibitioned on a federal level. Presumably, SLANG’s revenue potential would be substantially more robust at that point (likely THC branded product availability and additional dispensary penetration). It also includes 82.5M Organa Brands options (pro forma 2018 revenues of $60M, according to Clarus) which, if exercised, would significantly elevate SLANG’s revenue potential. That would likely be *3-times TTM revenues Origin House produced in fiscal 2018 (*Q4 2018 financials not yet released) alone. I do not know if SLNG offers the most explosive upside potential vs. the field, but I do believe it carries an excellent risk/reward profile here. At minimum, top heavy vertically-integrated portfolios may find the company’s brand/distributor-centric business model attractive to diversify against inherent risks endemic to VI multi-state operators. We’ll take the over on Clarus Securities 12-month target price of $5.00 per share. Please conduct your own due diligence and/or contact your financial advisor for advice before acting on the information provided within. Please take into account the frothy macro economic picture before selecting appropriate stake points. The author does not have any financial interests in SLANG Worldwide, nor does Midas Letter have any working agreement with the company. No compensation was derived—nor expected to derive—from this report. The motivation for writing this piece was strictly informational, and to provide our readership with an actionable investment thesis.